We often use food as a way to make ourselves feel better if we’re stressed, bored or lonely, but these foods are usually unhealthy ‘comfort’ foods, full of trans fat, salt and sugar, which really don’t help our waistlines and do nothing to lift our negative moods either. As a low mood can be a common side effect of phentermine, it’s important to find healthier ways to help boost your mood naturally, such as by eating healthy foods full of the nutrients that we typically lack when we’re feeling low. Here we have some healthy foods to help boost your mood while also helping you to continue losing weight with phentermine. In addition to vitamins A, B6 and C, fiber, potassium, phosphorous, and iron, bananas contain the important amino acid tryptophan. The mood-boosting carbohydrates in bananas help the absorption of tryptophan in the brain, and vitamin B6 helps convert the tryptophan into the mood-lifting hormone serotonin, which helps to boost your mood and also regulates sleep. Because of its ability to raise serotonin levels, tryptophan has been used in the treatment of a variety of conditions, such as insomnia, depression and anxiety, and the potassium in bananas is great if you’re feeling tired or stressed. Bananas are great for breakfast as they provide lots of slow-releasing energy, meaning they will keep you feeling fuller for longer; the best ones to choose are slightly green ones, as they will boost your metabolism with their 12.5 grams of resistant starch – more than twice the amount found in a ripe banana. Brazil nuts are a great source of selenium, a mineral which is often lacking in our diets. Studies have shown that people with low selenium levels have increased levels of depression, irritability, anxiety and tiredness. Selenium is also important for the proper functioning of the thyroid gland, which controls metabolism and the process of turning food into energy. As well as helping to boost your mood, Brazil nuts are a great source of filling fiber and muscle-building protein plus they contain healthy fats and other vitamins and minerals. Try eating three or four Brazil nuts alongside a handful of almonds and a piece of fruit as a mid-morning snack, or sprinkle some chopped Brazil nuts on a salad or stir-fry. Selenium can also be found in the premium weight loss multivitamins Phen Vites to make sure you’re getting enough of this crucial nutrient every day. As well as being good for your heart and helping your body to metabolize body fat better, omega 3 fatty acids are important for your mental health and wellbeing. Studies have shown that people who are deficient in omega 3 fatty acids may be more susceptible to depression and low mood. So, oily fish, which is high in omega 3s, and has the best protein to calorie ratio, is a great option to boost your mood and to help you lose weight with phentermine. The omega 3 fatty acids found in oily fish such as salmon make up a large percentage of our brain tissue, so eating a diet high in omega 3 will also keep your brain healthy and improve mood by keeping brain cells flexible, so the brain’s messengers – neurotransmitters – can work more effectively. Certain deficiencies in B vitamins have been linked to depression – serotonin production can actually be hindered by low B vitamin levels. Important B vitamins to look out for include folate, vitamins B5, B6 and B12, which are all included in Phen Vites, the only multivitamins specifically designed to boost weight loss. Eating leafy green vegetables – such as spinach or broccoli, for example – will help keep your B-vitamin levels up, as well as helping to fill you up on less calories. Spinach is great raw in a salad or add it to smoothies, stir-fries, omelets and soups. Lentils are a fantastic kitchen staple; with their combination of fiber and complex carbs they are a great low-calorie way to fill you up, plus they’re high in protein. Also, as a complex carbohydrate, like bananas, they have the added benefit of helping to increase the brains production of the feel-good neurotransmitter serotonin. This results in a calmer, happier state of mind with less anxiety as evening out your blood sugar level is important to maintain a stable mood, as well as stable hunger levels. Lentils are also high in folate – deficiencies in folate have been linked to depression, so topping up your folate levels with the premium multivitamins Phen Vites is a great way to ensure you’re getting enough. Lentils can also boost your iron levels which will give you energy and therefore put you in a better mood, and iron is also crucial for maintaining a good metabolism. A great way to include lentils in your diet is to use them in homemade soups and stews – to make them easier to digest, soak them for a few hours before cooking. Vitamin D deficiency is linked to many health problems, such as depression, osteoporosis, heart disease and cancer. The best source of vitamin D is sunlight (the action of sunlight on the skin allows our bodies to manufacture vitamin D), but if you aren’t getting enough sun, try to include foods that include vitamin D in your diet such as yogurt. The calcium found in yogurt can also help reduce your levels of stress and anxiety, plus it acts as a fat-burner so make sure to include good sources of calcium in your diet. Eat chicken and turkey breast to increase your intake of the amino acid tryptophan. As we explained above, the body uses tryptophan to make serotonin – one of the most important neurotransmitters affecting mood, and also to make the hormone melatonin, which helps regulate sleep. They also contain another amino acid, tyrosine, which can help reduce symptoms of depression as well as help us to avoid feeling the blues in the first place. Tyrosine, which is also found in Phen Vites, is used to make the hormone adrenaline – low levels of adrenaline have been associated with depression. Both meats are also excellent sources of protein, keeping you full for longer and helping to stave off hunger pangs and cravings. The good news is that chocolate is one of the ‘bad’ foods you should be eating, as chocolate isn’t just a delicious treat, it can give your mood a lift as well. A small square of dark chocolate can cause the brain to release endorphins and boost serotonin levels, plus studies have shown that those who eat a little chocolate each day produce less stress hormones and their anxiety levels decrease. Dark chocolate also slows down digestion so you feel full for longer and eat less at your next meal, and dark chocolate is full of MUFAs which boost your metabolism to burn more fat and calories, plus indulging in a little chocolate will stop feelings of deprivation while curbing sweet cravings. Making sure to eat foods which boost your mood is especially important as we enter into the shorter days of fall. However, while these delicious foods will help to top up your feel-good hormones and many of the nutrients we’re missing in our modern diets, it’s often difficult to eat a wide enough variety of food while also trying to lose weight. For this reason, we recommend that you add the weight loss multivitamin Phen Vites to your phentermine prescription in order to benefit from many of these mood-boosting nutrients and more, including the serotonin booster 5-HTP, which also suppresses appetite and helps to regulate sleep patterns. 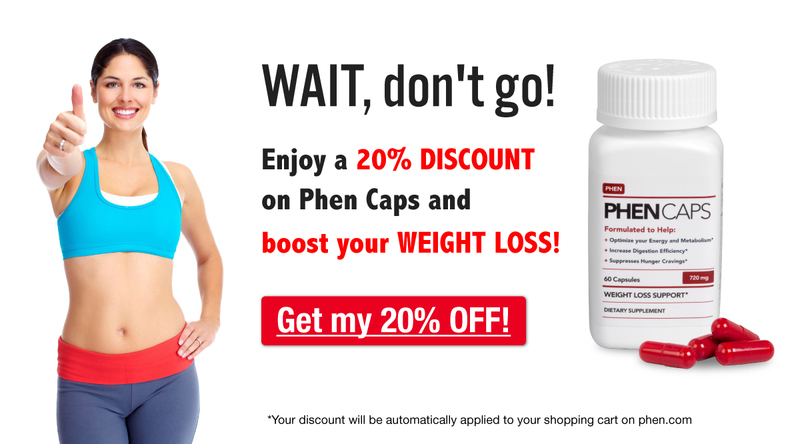 And, for your best chance of success, combining multivitamins with the official alternative to phentermine, Phen Caps – which give you energy, reduce cravings and curb your appetite – will give you everything you need for a happy, healthy weight loss journey!